Minimum base cabinet 36"-39" (36" may require cabinet modifications). Taking kitchen functionality to the next level, the Undertone(R) 43" trough sink is suitable for installation as a secondary or prep sink for ultimate flexibility when designing a custom workplace. 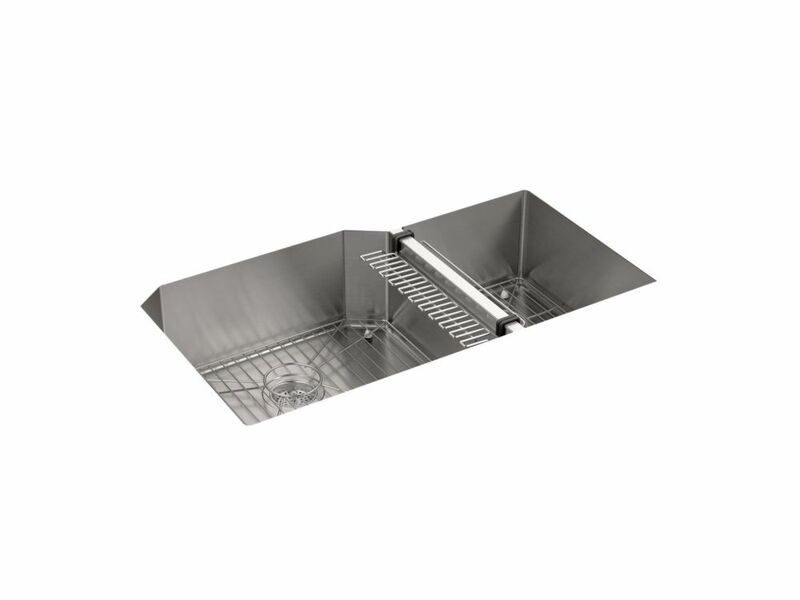 This model features a depth of 5-5/16", undercounter installation, and stainless steel construction that is both durable and stylish. SilentShield(R), an exclusive sound-absorption system, reduces disposal noise and vibration from dishes and running water for quiet performance. Strive Undermount Stainless Steel 20-1/4X35-1/2X9-5/16 0-Hole Double Bowl Kitchen Sink This Strive kitchen sink offers professional style with easy-to-clean curved corners. Made of thick, premium quality 16-gauge stainless steel, the unique extra-large offset bowls maximize cabinet space, making room for your largest bakeware and cookware. Strive features a sound-absorption system that significantly reduces disposal and dishwashing noise. This sink includes a divider dishcloth bar, a divider utility shelf for scrubbers and sponges, and a bottom sink rack to help prevent scratches. Strive Undermount Stainless Steel 20-1/4X35-1/2X9-5/16 0-Hole Double Bowl Kitchen Sink is rated 5.0 out of 5 by 2.